The department of Puno is fundamentally a high plateau (3,500- 4,800 m.a.s.l.). 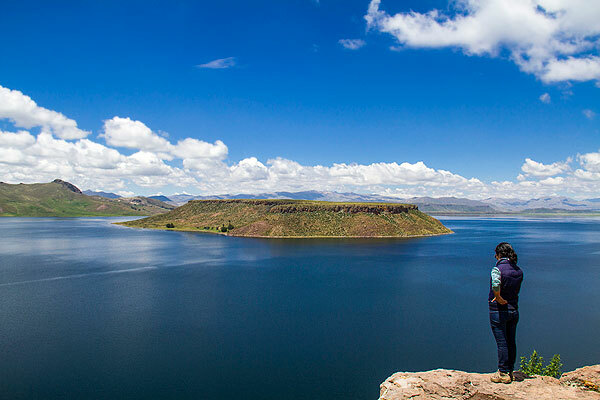 Its landscape surprises because of the vast Lake Titicaca, the highest navigable lake in the world, and the snow-capped peaks flanking its eastern side. It has been the origin and cradle of big pre-Hispanic civilizations and of the mythical legend of Manco Cápac and Mama Ocllo who emerged of its waters and went to Cusco to found the capital of the Inca empire. 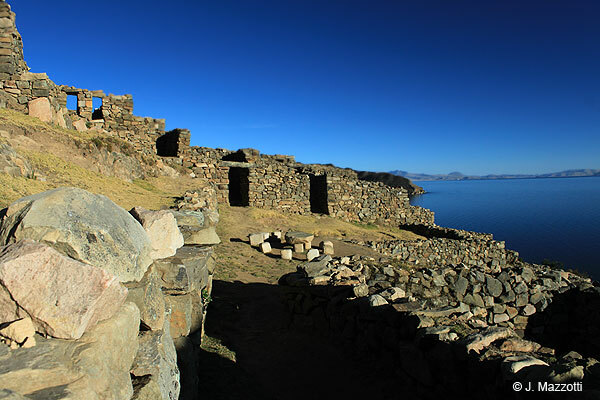 The Collao plateau and around Lake Titicaca have been the origin of several pre-Inca cultures like Pucará, Tiahuanaco, Collas, Lupacas, then was domain of the Inca Empire. Numerous archaeological sites on the islands Taquile, Amantaní and Sun Island where the Inca religion attributes the birthplace of the Sun God. Usually these sites are visited on excursions to the towns around Puno City and visits to the islands of Titicaca. Located on the shores of the Umayo lagoon. Famous for its chullpas, great circular towers built to store the funeral remains of leading authorities for the ancient inhabitants of Collao. Some reach up to 12 metres high, and their bases are smaller than the top parts. The Site Museum, which holds various items from the Colla, Tiahuanaco and Inca cultures, is located just a short distance away. The funerary tower is called chullpa. 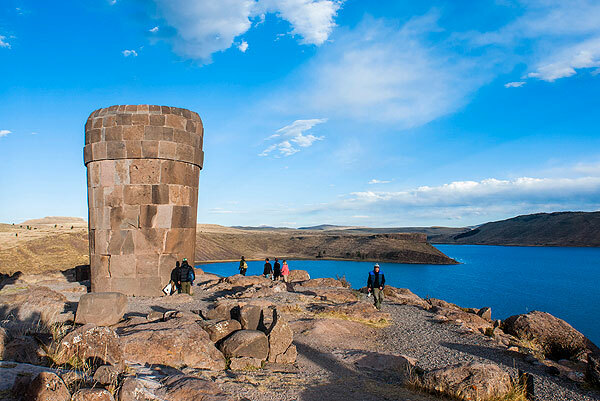 Dating back to Inca times, Sillustani is 4 Km from the Hatunqolla site, capital of the Colla kingdom. It is famous for its chullpas, built to host the bodies of the Umayo peninsula aristocrats. Variously sized, the chullpas can be 12 meters high and either rectangular, square or circular. Many are built rustically, others are fine Inca stonework, and others still are built in adobe brick. Superb construction techniques were used in their internal false vault and lateral rock interlocking. Outside they are made with polished and cushioned ashlar, showing cornices and relief animal decorations. Typical Inca materials combine with Colla elements. Some evidence shows that many chullpa were painted in white. Similar chullpa can be found in places like Viscachani, Paro-Paro and Katati in the same region. Visiting Hours: Mon - Sun 8:00 am - 5:00 pm. Location: 34 Km north of Puno City (35 minutes by car) deviation on the road Puno city to Juliaca. 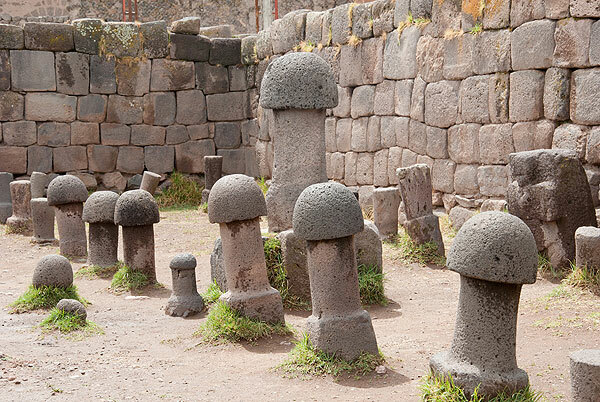 Pre-Hispanic altar dedicated to the cult of the fertility, scattered with large stone phalluses on the dusty ground. Location: At Chucuito 18 Km (11 miles) south of Puno City (15 minutes by car). It is a pre-Hispanic cemetery that belonged to the Lupaca and Colla Lordships. Located atop a table-topped volcanic hill and surrounded by a fertile plain. 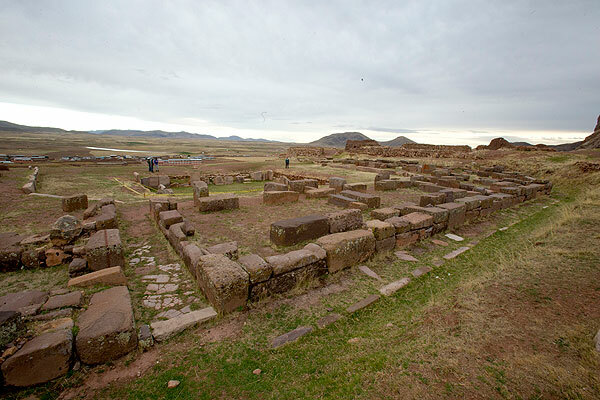 The chullpas of this place are better preserved than the Sillustani, some have cylindrical shapes and other square. Although there is evidence of 8,000 years old rock-art, the main structures date from 1100 A.D. to 1450 A.D. There are also Inca archeological remnants. The chullpas or pucullos, large fortified burial towers, overlook the landscape. 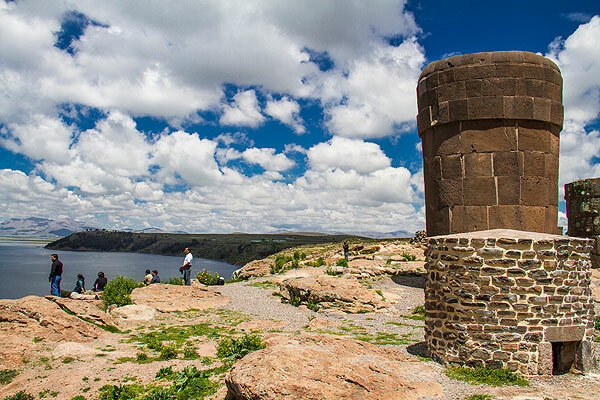 Located near kilometer marker 17 of the Puno - Moquegua Highway, south of Puno City (20 minutes by car). Ceremonial centre of the Pucará culture, built around 200 A.D., and reaching its zenith between 250 B.C. and 380 A.D. Two different sectors can be distinguished: a ceremonial area comprising nine pyramids and an urban sector. This 4 square kilometers archeological site, in activity around 150 AD, is located at 3.825 m.a.s.l. It stands out for its monumental architecture boasting a group of pyramidal mounds built over echeloned platforms. The most important among them is Kalasaya, where stucco walls were painted yellow. On the eastern and upper sector of the pyramid, sits what is left of a small temple called Red and White, of semicircular shape open through a stairway to a square, sunken plaza. Human rests and fragments of gold, silver and copper artifacts have been found in the funerary chambers on each side of the square open to the outsides through double threshold gates. A series of small chambers of obvious ritual function can be seen surrounding the higher side of the plaza. The faces of the platforms were decorated with stone sculptures, presumably those of The Beheader, sculpted, fish images, and a stone-slab decorated with representations of lightnings. Excavations have revealed a group of profusely decorated ceremonial vases and small stone sculptures placed in niches. Visiting Hours: Tue - Sun 8:00 am - 5:00 pm. Location: 107 Km. (66 miles) north of Puno City (1 hour and 45 minutes by car), 1 Km from the Pucará Town (5 minutes by car). Daily tours from Puno, boarding Catamaran Cruise Ship.